And you are? 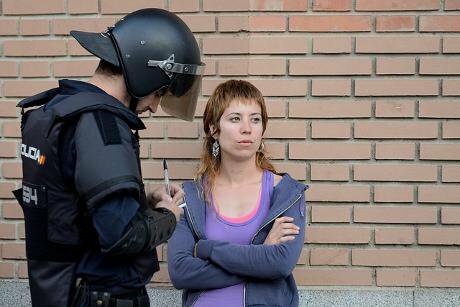 Police impeding a protest last month against an eviction in Madrid. Adolfo Lujan / DISO Press. Some rights reserved. I’ve spent time with Jorge. He is not a professional agitator: it would be hard to find a nicer and gentler man. But he is typical of many Spanish people who believe the response of their authorities to the deepest economic crisis many can remember must be questioned. In 2012 there were fully 15,000 demonstrations throughout Spain—in 2013, 25,000. This major social mobilisation is the organised public response to high unemployment and austerity measures adopted by the central and autonomous regional governments, which have resulted in cuts to basic services including health and education. It is the resistance of groups affected by decisions they consider in violation of their human rights. For the authorities the increasing number of demonstrations however shows that citizens enjoy their human rights, including to peaceful assembly and expression. They also claim that public order needs to be maintained and that the police need the power to do so. Yet the authorities’ response to the protests has been characterised by unnecessary and excessive force. They have fined participants and organisers, harassed, stigmatised and imprisoned ordinary people on criminal charges and introduced legislation that imposes additional restrictions on the freedom of peaceful assembly. Sadly, the organisers of protests and the participants face many challenges when trying to gather peacefully and express their views to those they voted into power. First of all, a gathering or demonstration with more than 20 people requires prior notification to the authorities, in writing and at least 10 days in advance—Spanish legislation doesn’t allow for spontaneous demonstrations. Only in urgent cases, which must be justified on extraordinary and serious grounds, can notifications be accepted within 24 hours. It is not however clear in the law what amounts to extraordinary or serious grounds—even if there is not enough time to apply for an authorisation and there is a specific need for an urgent political message to be delivered. The concern is that notification has become the mechanism for authorisation. Penalties for attending demonstrations without the required notification have been reported throughout Spain. When there is a peaceful assembly the police usually carry out a collective identity check, asking each of the participants for ID and recording their details. Some might find out weeks or months later that they have been fined for participating in an un-notified demonstration or for obstructing traffic. Participants attending a demonstration of which the police haven’t been notified can be fined between €300 and €30,050 euros, simply for their attendance. This is stretching the law where it shouldn’t go. Indeed most protests are banned or dispersed with the justification that the authorities are preserving law and order. Whiles states have an obligation to guarantee the rule of law, some degree of tolerance for the inevitable disruption demonstrations entail is important. To exercise the right to freedom of assembly means protesters must have a real opportunity to get their message across to the right people, particularly when this relates to public representatives. Assemblies should be encouraged and not repressed. Protest is a necessary check on political power. Yet the authorities have also imposed a general restriction on all demonstrations in the vicinity of official buildings or institutions or offices or residences of key politicians. This goes beyond what is allowed under international human-rights law. Surely, if you want your messages to reach those in power, you have to go somewhere where there’s a chance they’ll hear you. Of course, the security forces are empowered to take act to maintain order during demonstrations but there is a clear distinction between peaceful protest and violent disorder which could lead to a breach of the law. The police are entitled too to carry out identity checks on the streets as part of their duty, when such checks are necessary to ensure security. But they should not be used to intimidate or control those who are law-abiding. Spain is restricting the rights to peaceful assembly, association and free expression in a manner inconsistent with international human-rights standards and a country’s obligations under international law. And, rather than seeking to close these gaps, the government has taken a step further—submitting legislative proposals that would increase the scope for penalising protest organisers and participants. Spain is not alone. Many demonstrations have taken place in cities across the EU in response to austerity measures. As public resources and services have become more scarce, anger over cuts in jobs and incomes has grown—leading to widespread protests, sometimes violent. In Greece, Spain and Romania the police have used force to disperse these demonstrations. Human-rights organisations have documented incidents in several countries: use of excessive force, abuse of “less-lethal” weapons, obstructing access to medical assistance and arbitrary detention. In many cases, officers have repeatedly hit peaceful demonstrators with batons, including on the head and neck, causing serious injuries. We must also remember how easy it is for a situation to get out of hand. In Turkey and Greece, for example, violent disturbances have issued from a disproportionate reaction by the police to those who had gathered peacefully on the streets. The police may confront demonstrators with the stated aim “to protect public order” but when they adopt an attitude of hostility towards those criticising the government—imposing excessive restrictions and force—they become the object of the protesters’ anger. The result is a loss of trust and respect and, as we’ve seen, violence which threatens the safety of all: protesters, passers-by and the police themselves. We have also seen in recent years in Russia and, in the past year, in Ukraine how far a situation can escalate when the authorities do not give space to public protest but instead introduce measures to repress peaceful assembly. A demonstration which ends in violence represents a failure on the part of the state to secure and facilitate a peaceful protest. The Spanish authorities have said the police often intervene when extremist groups turn a demonstration violent. Yet such talk is a distraction, an excuse for behaviour that falls short of international standards. The actions of a few should not lead to the abuse of many law-abiding people. There have been more peaceful protests in Spain in the last few years than there have been violent ones. Most cases of violence by the police themselves during demonstrations seem to be swept under the carpet. If an investigation is opened, it tends to drag on for years or to be closed because the officers were difficult to identify as they were not wearing a badge. In most cases there is no reparation for the victims. The authorities must look at restoring the confidence of the public by protecting and facilitating the right to protest. There are plenty of positive examples in the world of measures taken to prevent violence, even in tense situations. It can be done with good co-operation and trust between protest organisers, participants and law-enforcement officials. Communication and political will are required to avoid provocations (intentional or negligent) and misunderstandings, and to allow society to find solutions to problems together. Counterposing government to protesters can only mean human rights will continue to be violated and the freedoms for which people have fought will disappear. Restriction of freedom of assembly and peaceful demonstration may seem justifiable, even attractive, to government but it will only further alienate the public from those they have placed in authority. Protest is a necessary check on political power. A developed society sees peaceful assembly as a vital and healthy part of its existence—not something to be suppressed.